The word Saaga means a story. We would like to take you along in our story. 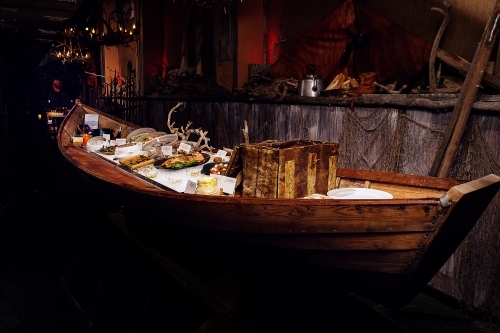 A meal at the Lappish Restaurant Saaga is an enjoyable combination of tastes, tales and sensations. At Saaga you will find a slice of the rugged and beautiful nature as well as regional dishes and an atmosphere full of the exotic charm of the North. We bring the enchantment of Lapland to our guests in our service, interior decor and table settings, as well is in our food. The pristine environment of the North creates an excellent place for wildlife and flora to flourish, so we use only pure Lappish and Finnish natural products. We also co-operate with several small producers to quarantee the good quality and specialized ingredients. Saaga has around 100 seats in two different floors. In the street level dining room we have a wooden starter buffet and in addition seats for 30. Upstairs seats for 70 in 4 different smaller areas. The inspiration for Saaga has been old stories and beliefs, creatures of Mother Nature and a pinch of the "magic madness" of Lapland. We welcome you to feel and enjoy the magical feeling with us - Buresboahtin!